A bizarre accident like a house divided in Baldwin House Park after a crane came smashing down through the top of the home. The crane could still be seen lying across the home around 1 p.m. on Lower Park road. 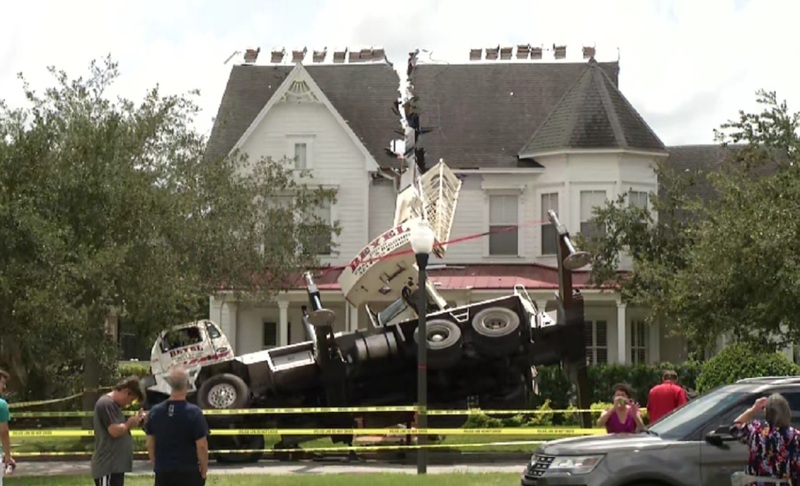 A video released of the scene where the accident took place appears to show a truck that was working on a construction job toppled over next to the home. The crane was extended at the time the truck fell over and had cut clean through the second story of the home. A witness who was nearby when the crane fell told local news she was visiting her daughter a few houses down when the crane came crashing into the home. "I just heard a little 'boom boom' in the distance and I really did not think about it," BettyLou Hyatt said. Hyatt said it was her daughter who alerted her to the damage to their neighbor's house and that is when she realized what the sound was. Officers said the homeowners had been made aware of the incident and Hyatt added that she expects they will be shocked by the extent of the damage. "I just think they're gonna just be flabbergasted when they come home and bring their children home from school and see this house that's just been really destroyed, just in a split second," she said. Investigators say no one was inside the home at the time the crane fell and no one was injured in the accident. Orlando Fire Department officials closed off the road in the immediate area as crews arrived at the scene. An Orlando Police Department spokesperson said the construction company required two cranes to lift the other larger crane up and out of the home. But not Alex Baldwin house….